South Korea has a great drinking culture, but until recently, quality beer was not part of it. 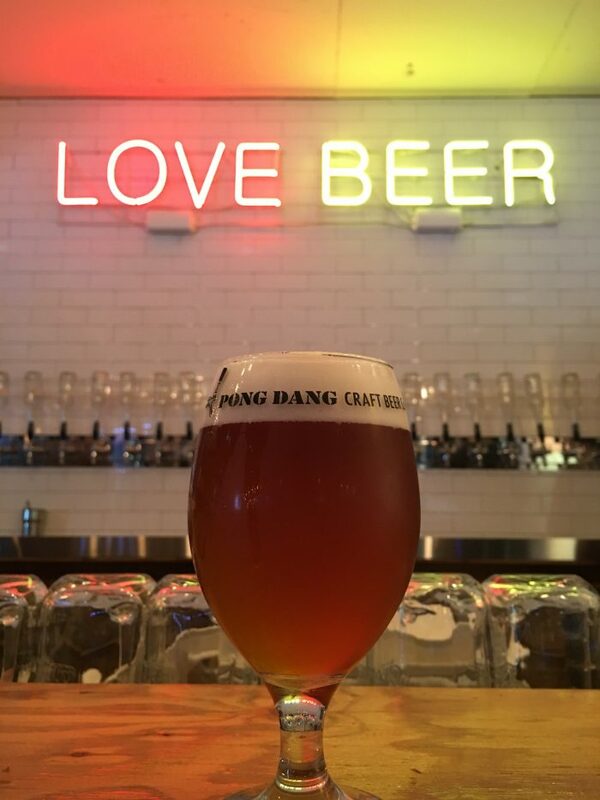 However, in recent years, there has been an explosion of craft beer in Seoul. 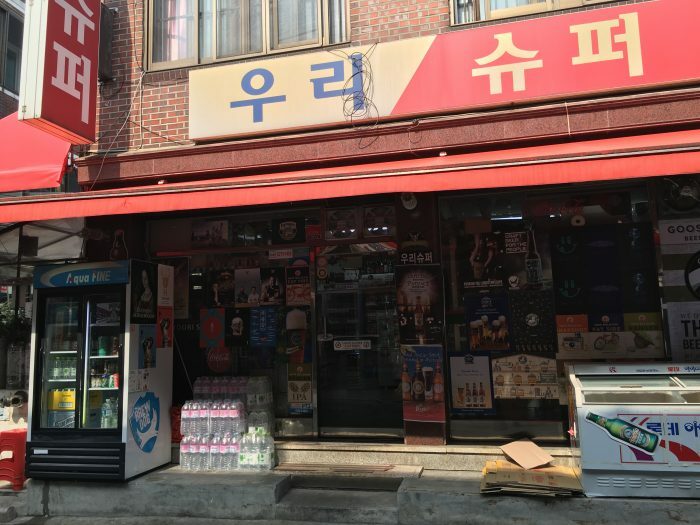 This craze has been fueled both by local interest in better beer, but also by Seoul’s position as an international city that has residents from all over the world. Seoul is a massive city, and when you get that many people together, they’re bound to bring in & adapt culture from home. 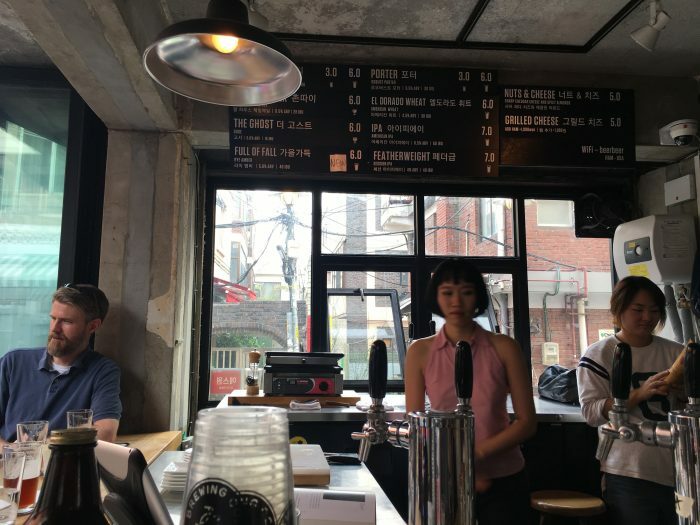 Seoul’s craft beer bars are mostly concentrated in two areas that have a large international presence: Itaewon & Gangnam. 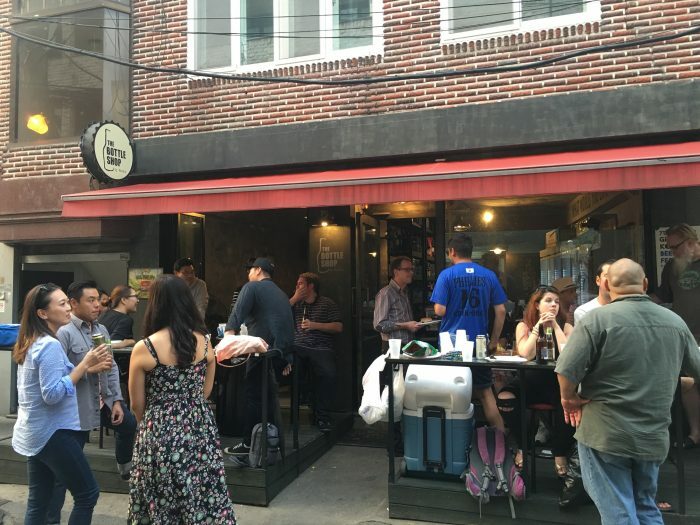 Here are some of the best places to drink craft beer in Seoul, grouped by neighborhood. 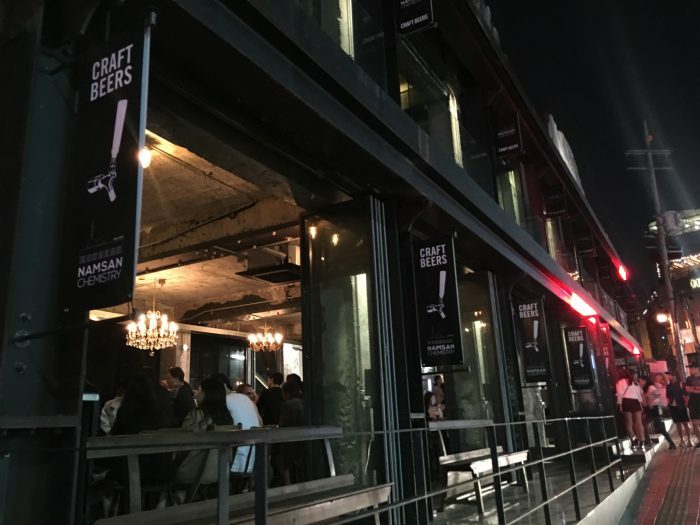 Craft Pub – The Four Seasons is located not far from Itaewon subway station. They have up to 5 of their own taps, though they only had 2 on when I visited, plus up to 8 guest taps, though there were only 6 of those on. They also have a few bottles available. The bar is in a basement space, though the lighting still kept it bright. The staff were nice, and the prices were very reasonable for Seoul. They even gave me free dumplings to try. 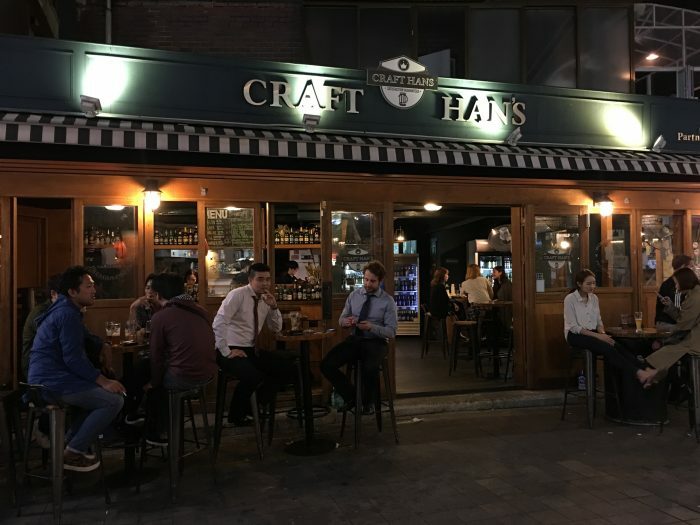 Craft Hans is just to the north of Itaewon station, on a street packed with bars and restaurants. They offer 4 taps of their own beer, plus a decent selection of bottles. There’s a nice outside patio where you can people watch the crowds, but the rest of the bar is very open as well. 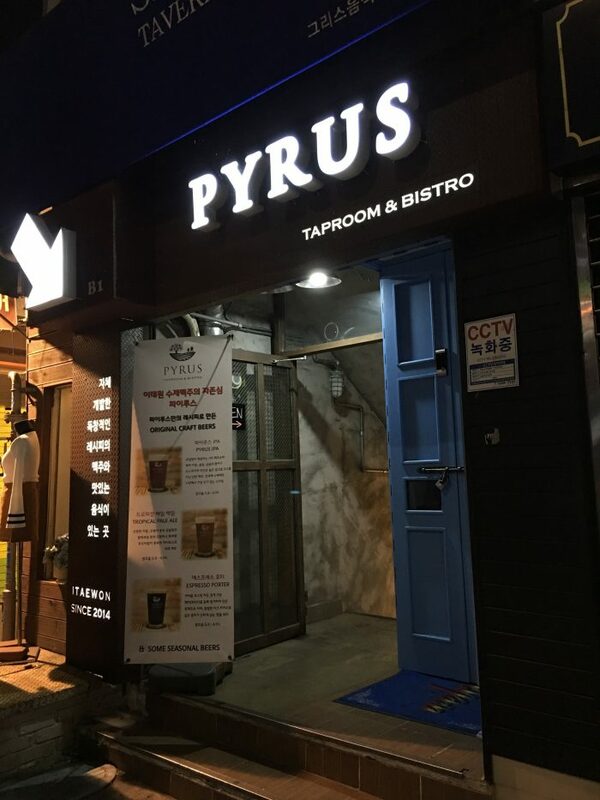 Just to the west, toward Noksapyeong station, is Pyrus Taproom. This is another basement bar, with 4 of their own taps, plus 4 more guest offerings from South Korea & the United States. They also offered a small selection of perhaps 10 rare bottles, as well as a food menu that featured pizza, pasta, and mac & cheese. This next batch of bars is a huge cluster that covers the blocks north of Noksapyeong station. 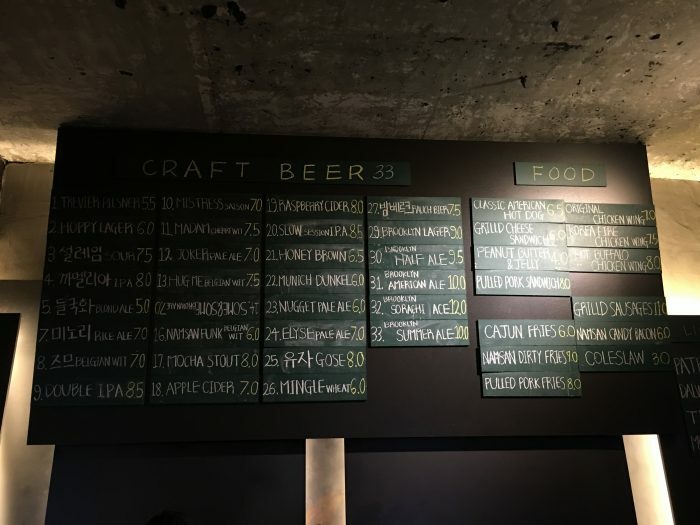 This is one of the most concentrated craft beer neighborhoods I have ever been to, and certainly the best place for options to drink craft beer in Seoul. You can wander around any of these bars and pick the place that fits your mood, since they all differ a bit in vibe & selection. Craftworks Tap House is set back a bit off the busy road, with a surprisingly peaceful patio area for the neighborhood. They offer a sampler of all 7 of their draft beers just 12000 won, though each beer is basically a large shot glass. It’s a good way to try them all though. Craftworks also has 4 or 5 guest taps as well. 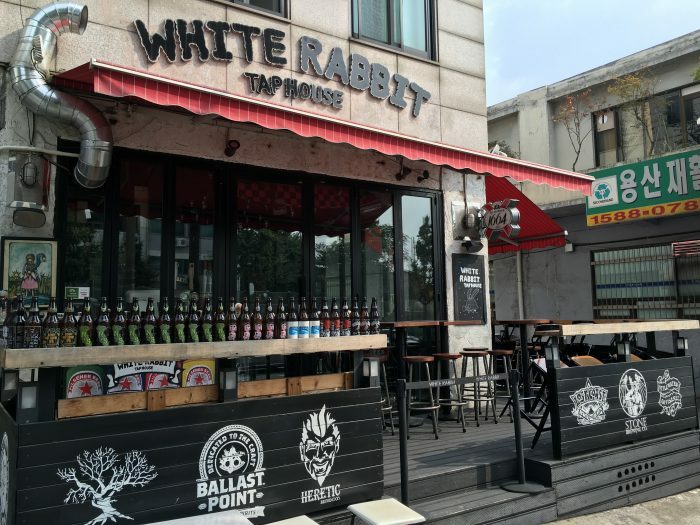 Nearby is White Rabbit Tap House, which boasts one of the better selections of craft beer in Seoul. They have 26 taps available. While only a few are local, there is a nice selection from the United States and Europe. They also have a huge whisky selection. White Rabbit Tap House is a friendly open spot with lots of fresh air, plus I liked that they kept refilling my pretzels constantly. It’s such a little thing to do, but it goes a long way. Pongdang is one of the largest craft breweries in South Korea, with a couple of bars in Seoul. The one in Itaewon is called Made In Pongdang. The tap selection of 6 beers isn’t huge, but it’s complemented by a large selection of hard-to-find bottles from the United States and Europe. On the night I visited, there was a tap takeover on. The food menu specializes in fried snacks, one of which was Korean, so I had to try it. It was called kim malee, and it was essentially a fried roll of noodles wrapped in seaweed. Keg B appears to have multiple locations in Seoul. The one I visited was located off an alley on the same street as Made In Pongdang. The bar has multiple floors, including a roof terrace. A different bar called Freedom occupies the ground floor. Keg B 10 taps of Korean & American beers. Since the bar is a bit off the main road, it’s a bit quieter than some of the others in the areas. 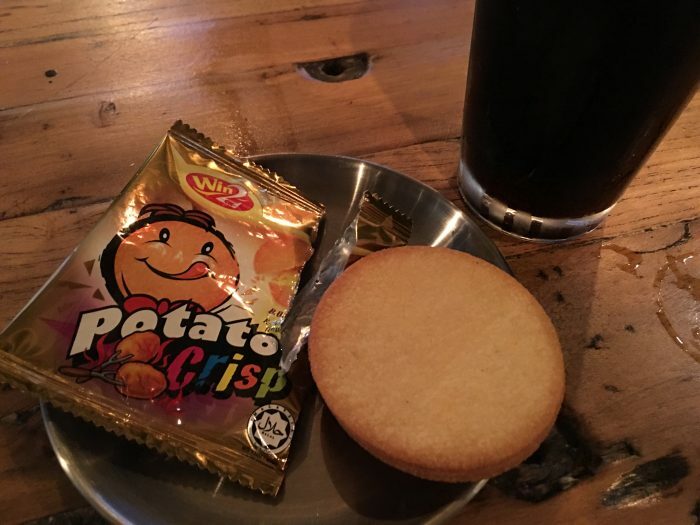 Each beer I ordered came with a free potato crisp. This can best be described as a combination of a cracker & a Pringle, with a tiny bit of sweetness due to a light BBQ flavor. They were kind of amazing. 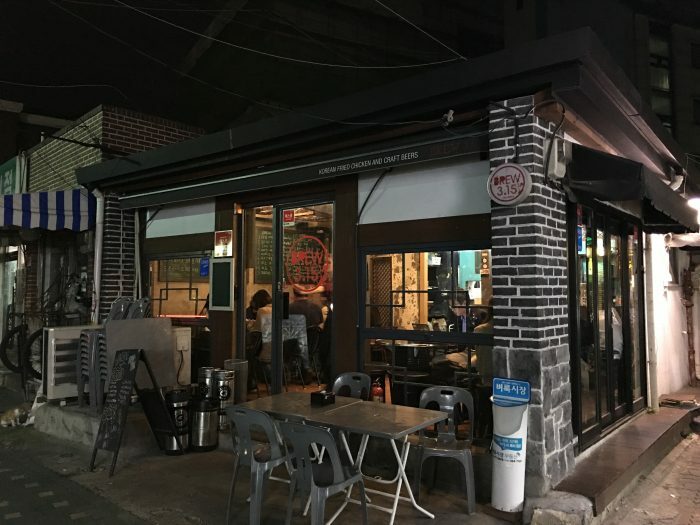 Magpie Brewing Company has a few locations in Seoul, a couple of which are on the same street in Itaewon. The first one I visited was a large open building with a nice outside patio. They feature 8 taps of their own beer, at some of the cheapest prices. 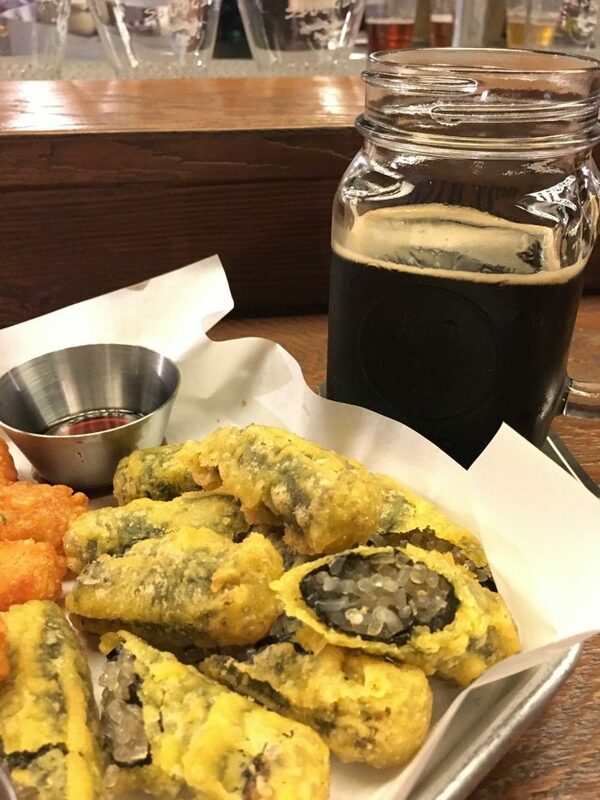 Given that they also make some of the best craft beer in Seoul, they’re a must-visit. The staff were the friendliest I encountered, which is saying something, as nearly all of the other bars I visited were also welcoming. Down the block, Magpie has a basement bar with the same beer, but also with pizza. I visited just an hour after it opened, and it was already very busy. Magpie is the sort of brewery you like to see in a burgeoning market, as they are helping push towards better quality. 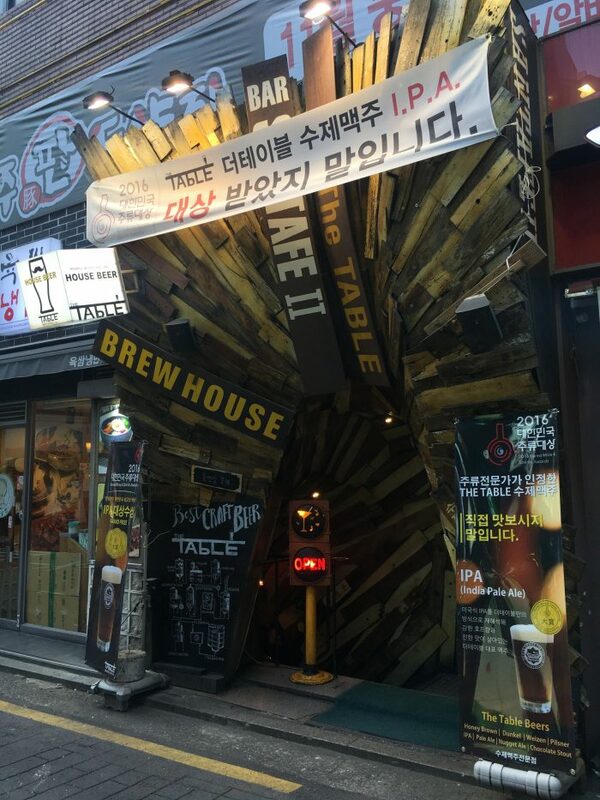 The Booth is a brewery that has a few locations around Seoul. I visited their location on the same street as the last couple I’ve mentioned, just off Noksapyeong. 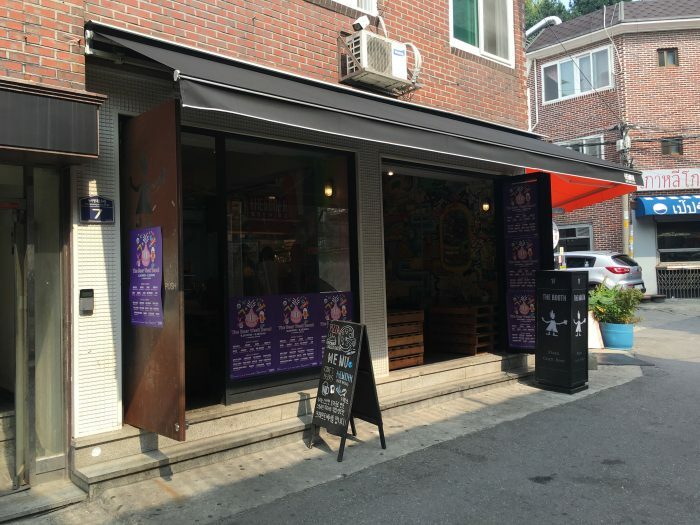 There is another outlet not far away near Itaewon station, along with a couple in Gangnam. As the name suggests, The Booth has craft beer & pizza. I wasn’t hungry, but the pizza smelled legit. They had 4 taps, plus a half dozen or so cans & bottles. At the time of my visit, they only had a couple of Korean beers available (both their own), and the rest were from the United States & Europe. It was a cool little laid back place, even if the selection wasn’t huge. Across the street, they have another spot that serves as an overflow space & tasting room called Beer for Geeks. The Booth is ambitious, with growth plans including the United States. It will be exciting to see what they do in the future. In between Magpie & The Booth, there is a nice bottle shop. The shop has a large variety of beer available. None of them are local at the moment, but they have a massive selection of imports. Plus, there is an outside patio where you can drink your selection. Just down the street is yet another beer hotspot called The Bottle Shop. It was a popular bar filled with tons of expats. As such, there unfortunately weren’t any local Korean beers available, but the selection of imports was excellent. A couple of blocks deeper into Itaewon is Namsan Chemistry. On the surface, this seems like it is an amazing bar. 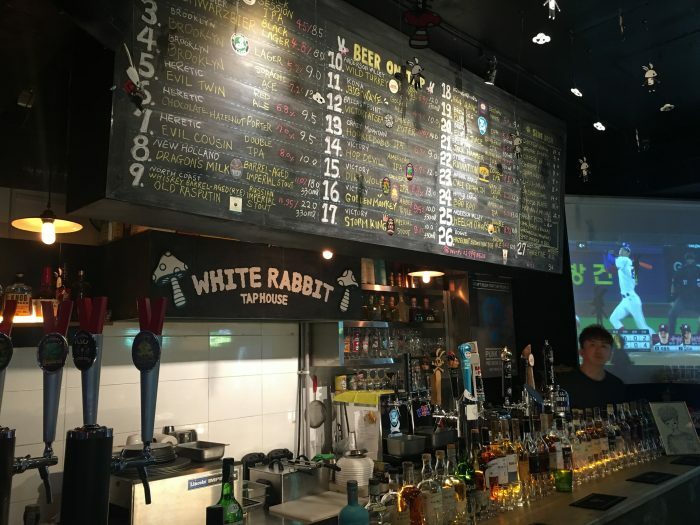 With 33 taps, it has one of the biggest selections of craft beer in Seoul. However, the experience beyond this failed on nearly every level. First off, here is the tap list from the day I visited. Notice something? This is a list of beers with basic style names, but almost no breweries. Good luck figuring out what you are actually drinking. Sure, some people won’t care, but ultimately this cursory amount of information is a poor practice. How can anyone respect an establishment that doesn’t respect its customers enough to inform them of what they are drinking? Of course, the place was packed, with electronic music blasting above the din, so it doesn’t seem to be hurting them. Service was nonexistent. Perhaps this was me being overly picky, but with so many other great craft beer options in the area, I’d rather go to a place that respects its customers. I’d hate to see one of the other spots go out of business because this place inexplicably drew people away by being “cool” but not being good stewards of quality beer. Now it’s time to move on to Seoul’s other craft beer hotbed, Gangnam. We’ll start with the South Korean outpost of Mikkeller, a mainstay from some of my other travels. The closest station to Mikkeller is Sinsa. The vibe in this area is much different from Itaewon. This is trendy Seoul, completely with the requisite shops & millennials doing photo shoots on the streets. Mikkeller fits this aesthetic with their typical decor. It was as if I had stepped into one of their bars in Copenhagen. 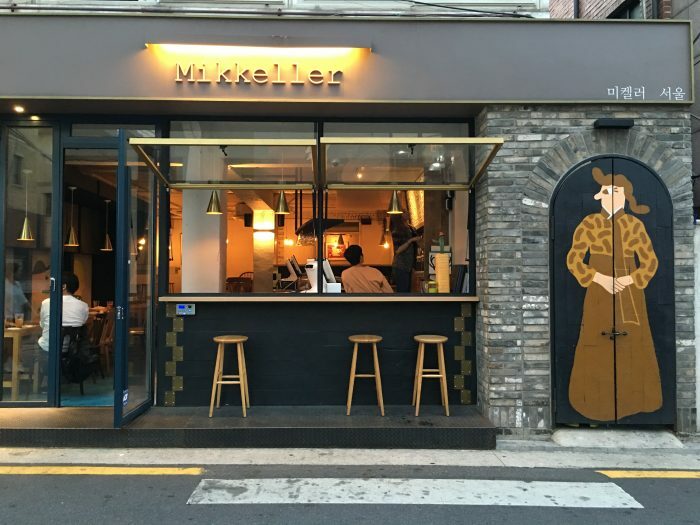 With 30 taps, Mikkeller has one of the largest selections of craft beer in Seoul. While the selection was of high quality, featuring great beer from Europe, the United States, and New Zealand, there were only a couple of beers from South Korea, and even those were Evil Twin & Mikkeller collaborations with local breweries. As the local craft beer scene develops, I would hope that this number would increase to support Korean breweries. 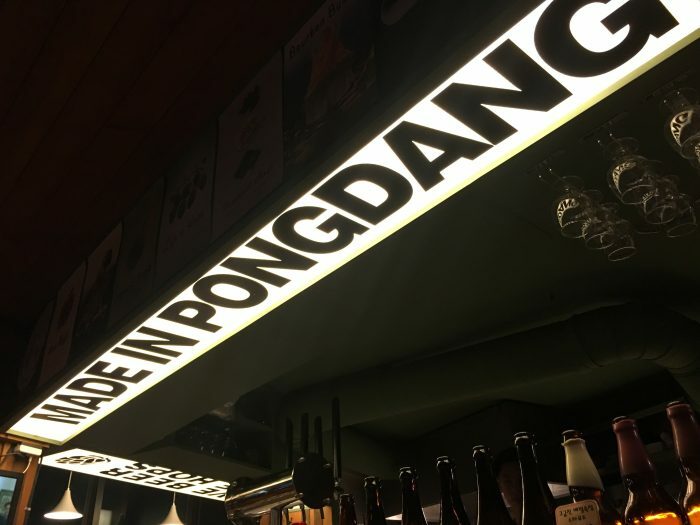 I’ve mentioned Pong Dang already, but the brewery’s larger bar is located in Gangnam near Sinsa station. 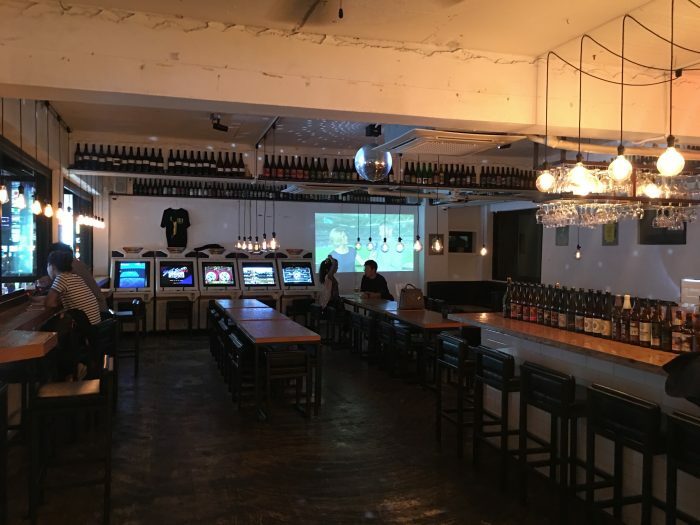 This was one of my favorite craft beer bars in Seoul. It was a nice spot on a 2nd floor, with large windows overlooking a busy area of the neighborhood. Inside, there were also arcade games & tons of seating. They host events & tap takeovers as well. With 6 taps of their own great beer, plus 5 guest taps from around Korea & the United States, there was a nice selection. This is the exact sort of bar I want to see thrive in a growing market because they clearly get what is important. Tucked around the narrow streets northeast of Gangnam station is The Alibi, a steak and craft beer joint. While I didn’t try any of the food, The Alibi has a great craft beer selection. The have 4 taps of their own, plus 8 guest taps, then a large bottle collection as well. It’s one of the larger bottle selections of craft beer in Seoul at around 150 bottles. They offer flights of the draft beers. When I stumbled upon The Alibi, they weren’t opening for another 30 minutes, but the bartender was nice enough to serve me a beer on a hot, sunny day because they were there anyway. That’s always appreciated. It was nice to be able to sit in the shade on their breezy patio & relax with some beer. 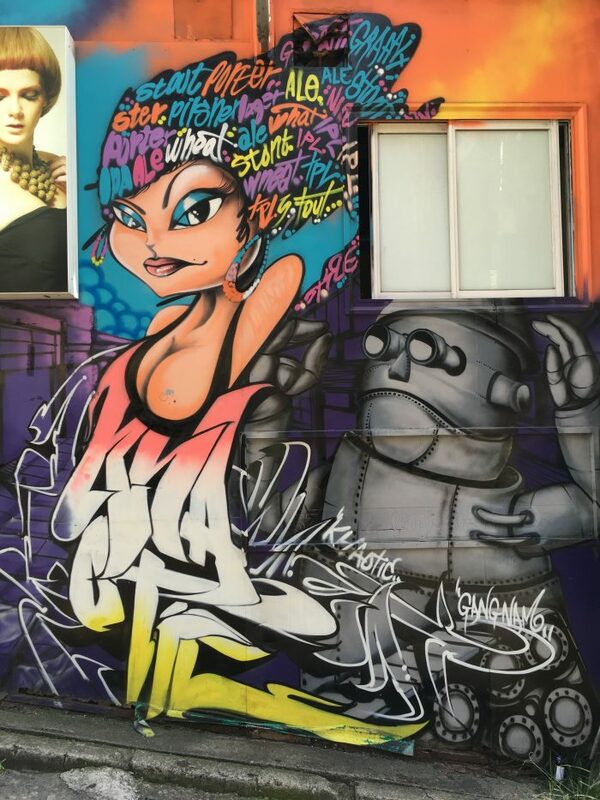 This was the mural painted on the wall across the street. 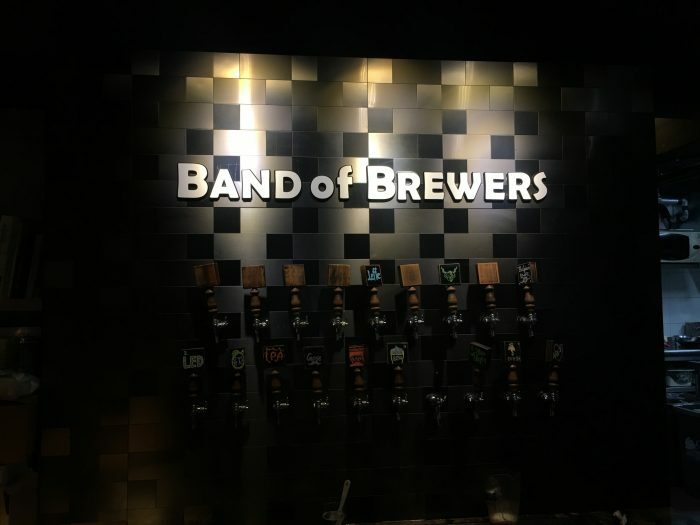 Band of Brewers is located in an area of Gangnam near Seolleung station that appears to mostly be office buildings. As such, the bars in the area are rather busy on a Thursday evening. This is the only craft beer spot of note in the immediate area, but it’s a decent one, offering 12 taps, 7 of which were their own or local, plus a selection of bottles. It’s not necessarily an area of Seoul that most visitors will find themselves in, however, it’s located not too far from Jamsil stadium, making it a nice spot to visit before or after a KBO baseball game. The bar in fact had another baseball game on the TV when I visited. 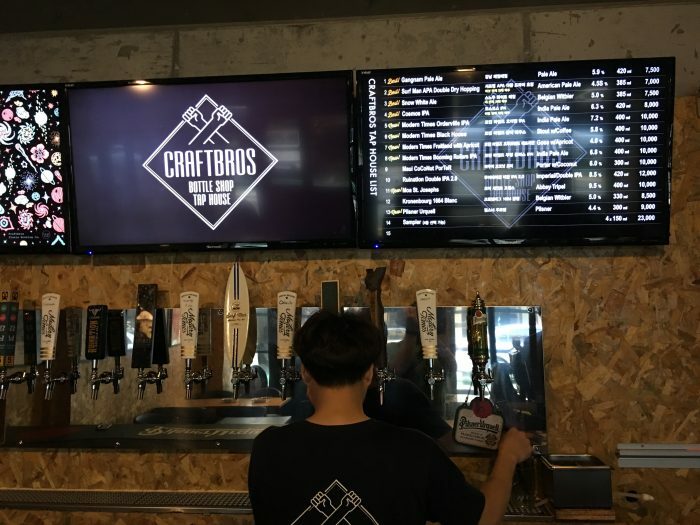 Craftbros Tap House isn’t located near much else in Seoul, but it’s worth taking a detour for. 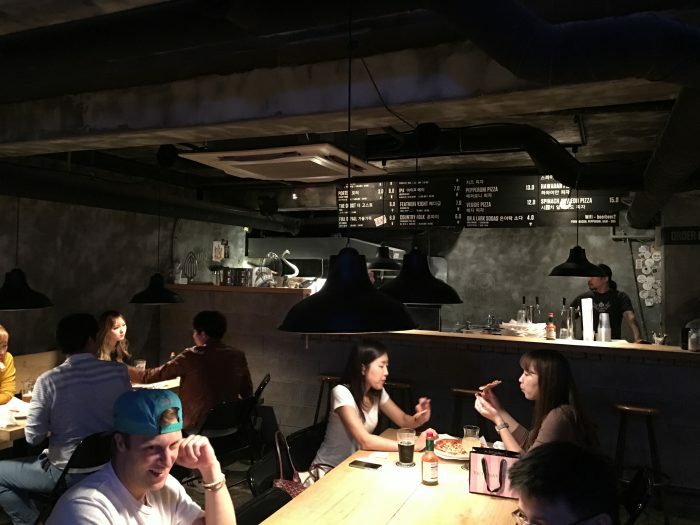 Located in a residential area south of Sinbanpo station, it’s part of a neighborhood that has the feel of a burgeoning hipster area, along with the requisite coffee shops. 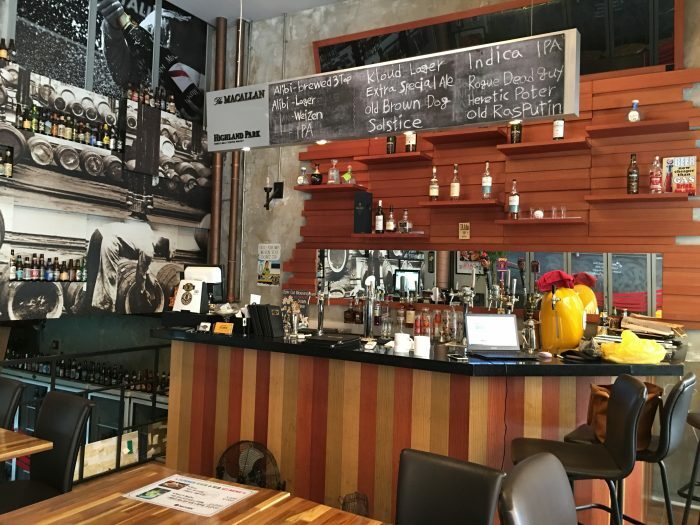 There’s another beer bar nearby called Thirsty Monk, though that bar specializes more in German beers. 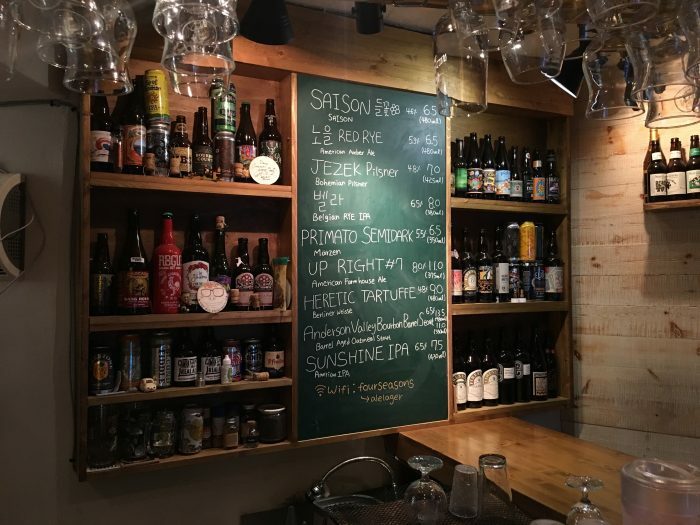 This combination tap room & bottle shop is one of the best places for craft beer in Seoul. The bar offers 13 taps of their own beers. Four were their own, while the rest were a quality selection of guests, mostly from American breweries. They had just had a Modern Times tap takeover on, plus they also had Stone available. The bottle shop had a great selection of American & European beers. The food also had an American angle, featuring mac & cheese and wings. Craftbros serves each of their own beers with different glassware & coasters for each, which is a nice touch. Definitely a place to check out, even if you have to go out of your way. Continuing our tour around places for craft beer in Seoul that aren’t really near anything else, we head to Gyeongbokgung. This area is famous for being home to one of the Five Grand Palaces of Seoul, but if you want a break from doing touristy stuff, Hopscotch is just a few blocks away. It’s amazing how a busy area can have a neighborhood like this right nearby. It’s a quiet area where you’d never expect to find a nice restaurant/bar like this. It leans a bit more to being a restaurant, but Hopscotch has 4 draft beers plus about 30 bottles, most of which are Belgian. To add to the “scotch” part of the name, there’s a whisky list as well. 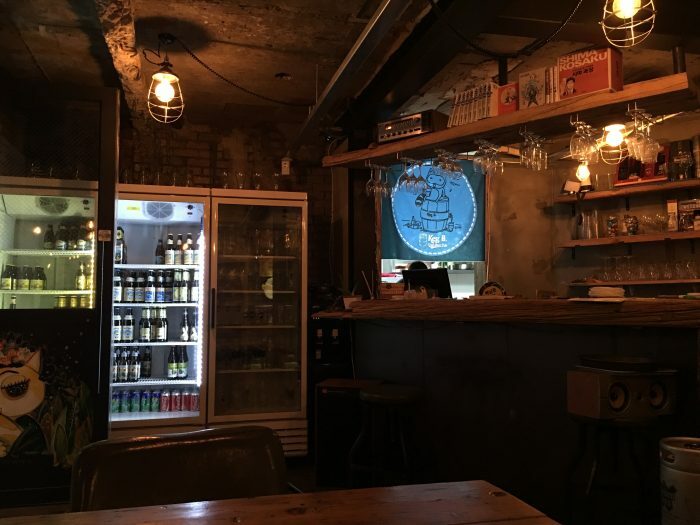 Brew 3.14 was one of my favorite craft beer bars in Seoul. It happened to be right near my hotel in Jongno-gu. 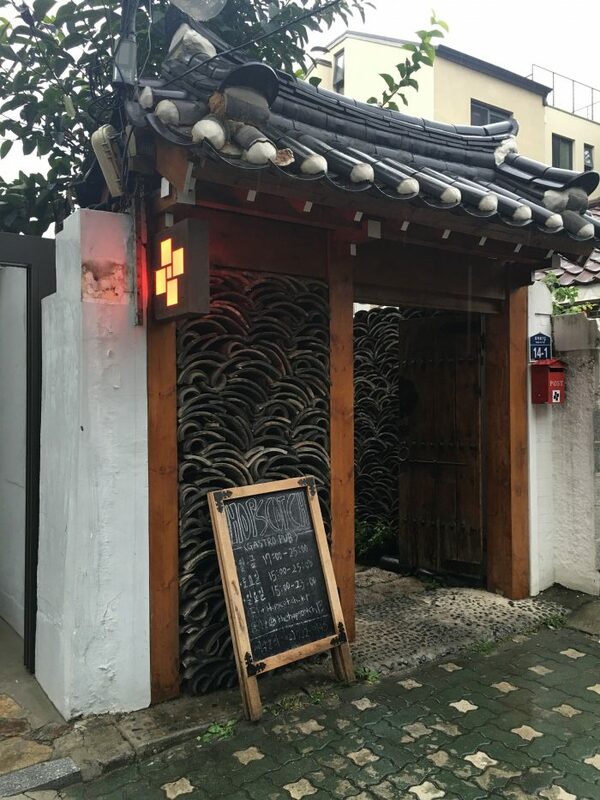 Just north of Jongno-3 station is a lovely area packed with bars & restaurants down narrow, twisting alleyways. 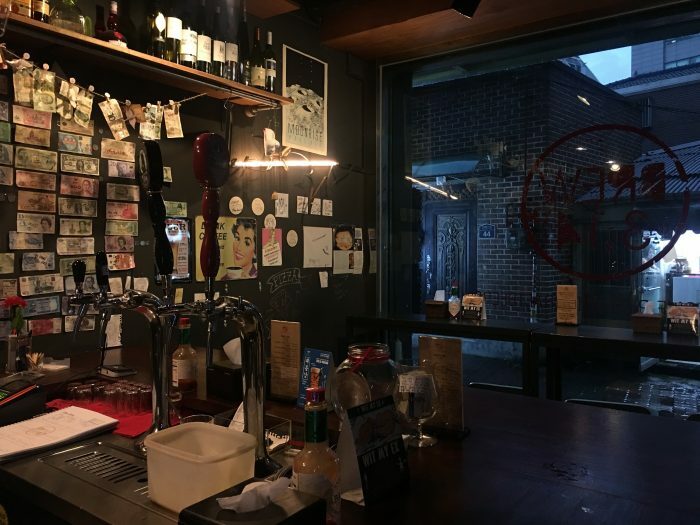 This is an amazing neighborhood for all kinds of nightlife, but head back deep into it, and you’ll find one of the best places to drink craft beer in Seoul, Brew 3.14. 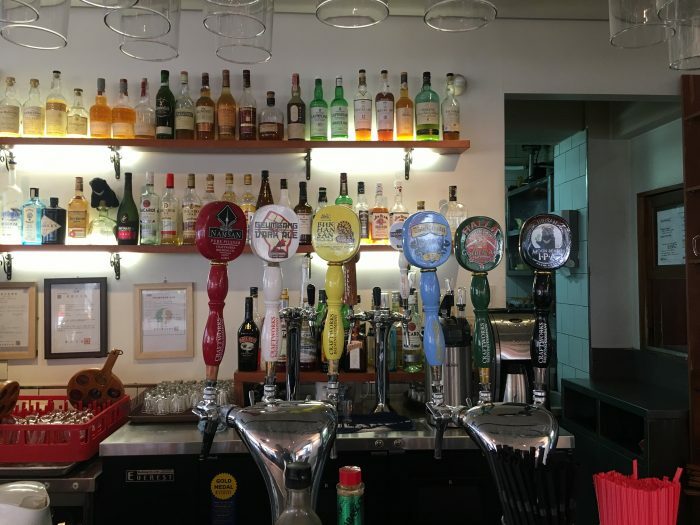 Brew 3.14 has 11 taps of Korean beer, plus pizza & fried chicken. It was the friendliest bar I encountered, consisting of a nice mix of both locals & travelers. There is a second separate section called 3.15 that has more seating space for groups. Some of the bars I visited in Seoul felt entirely local, and others felt like they were entirely expats, but this one bridged the two. 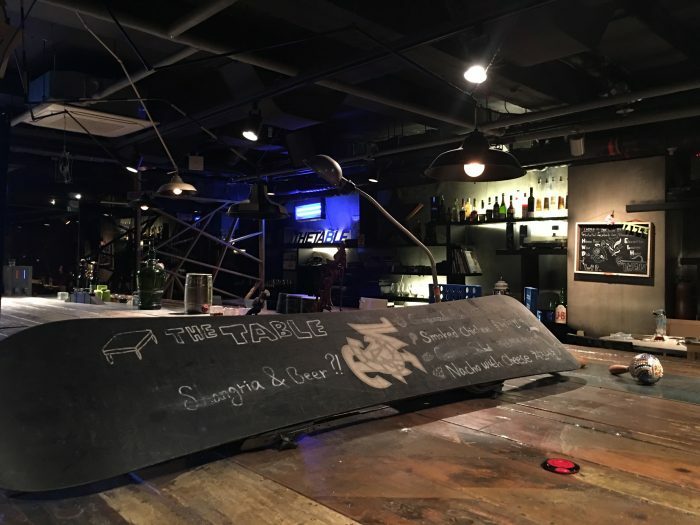 As a solo traveler, their bar seating was a great place to sit and talk to the staff & other drinkers. A bit further to the west along Jongno is The Table. This area has a lot of bars & restaurants as well, so it’s easy to overlook, but The Table is down in a basement. The Table has 8 taps of their own beer available. It’s a unique spot. Most basement bars tend to be dives, but this one was surprisingly spacious, with lots of seating both at the bar/large table as well as for groups. They also had a unique bar snack that they give out for free – toast sticks with a bit of sugar on them. Random, but any place that does free snacks is fine by me. The Table also has buttons on the tables to call the servers over, which helps with better service. In addition to the bars & breweries I’ve mentioned, Seoul also has craft beer events throughout the year. During my visit in late September/early October, there were two of note. 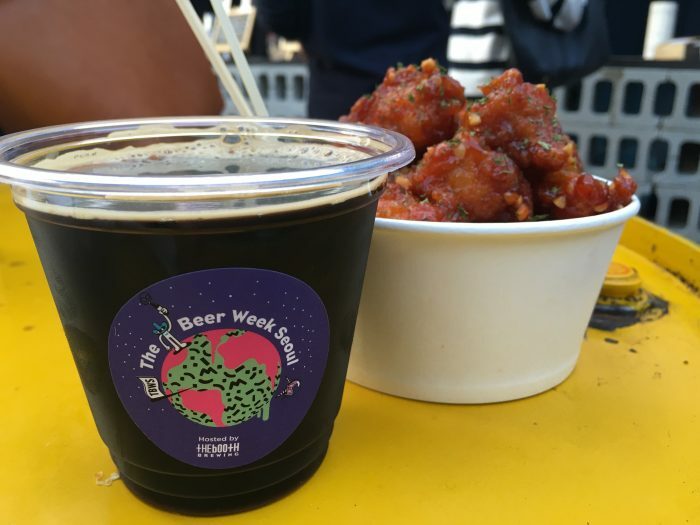 Unfortunately, I missed the Great Korean Beer Festival by just one day, but I was able to make it to the last day of The Beer Week Seoul, which was held at Common Ground near Konkuk University. Common Ground is a hipster shopping area made of shipping containers, but the courtyard was perfect for beer tents & food trucks. The Beer Week Seoul had dozens of local & international beers available. I had several, along with some great Korean Fried Chicken, which always goes well with beer. There were even more bars that I passed that I didn’t go into that listed craft beer outside. How good these are is debatable, but what can’t be debated is that Seoul is currently having a craft beer moment. There’s an energy to the scene that, while still in it’s nascent stages, has tremendous potential with the city being so big. South Korean craft beer wasn’t mind-blowing or particularly experimental at the moment. However, with such great interest in craft beer in Seoul, more adventurous brewing is an inevitable next step. Korea has so many unique flavors that it will be exciting to see where breweries eventually go. did you ever go to Maloneys pub? Did you ever try the DMZ or Whiteys? Is it two great beers right there.